This metallic silver and ivory A-line dress reminds us of Marilyn Monroe! The Silver Screen Starlet Metallic A-Line Dress would make a cute party dress or New Years Eve dress. 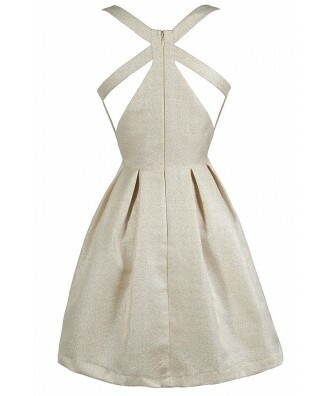 This dress is fully lined and made of an ivory fabric with silver metallic flecks throughout. It has two straps on each side that continue around the back, forming a unique design. This dress has a plunging neckline and lightly padded bust for support. The attached skirt has an A-line cut with subtle pleating. A hidden back zipper completes this look. The Silver Screen Starlet Metallic A-Line Dress would look perfect paired with beige or metallic pumps or strappy heels and a clutch. This is a cute dress for any upcoming dance or party. Details: Fully lined. Lightly padded bust. Hidden back zipper. Small measurements: Length from top of shoulder to hemline: 34". Bust: 32". 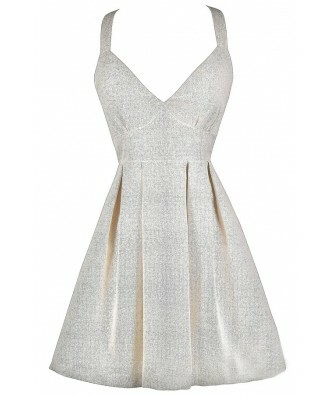 You have added Silver Screen Starlet Metallic A-Line Dress into Wishlist. You have added Silver Screen Starlet Metallic A-Line Dress for Stock Notification. You have set Silver Screen Starlet Metallic A-Line Dress as a loved product. You have removed Silver Screen Starlet Metallic A-Line Dress as a loved product.